Child-rearing was a much discussed topic in Enlightenment France. In 1762, philosopher Jean-Jacques Rousseau published Emile, or On Education, a treatise that included advice on raising morally and physically strong children. Rousseau encouraged mothers to breastfeed their children, promoted outdoor exploration, and supported the practice of good hygiene. Images of these 18th-century maternal and domestic ideals make up a substantial portion of Fragonard’s oeuvre. This particular motif of a dutiful mother about to wash the face of her young daughter is most likely an autograph copy of a painting currently in a private collection. 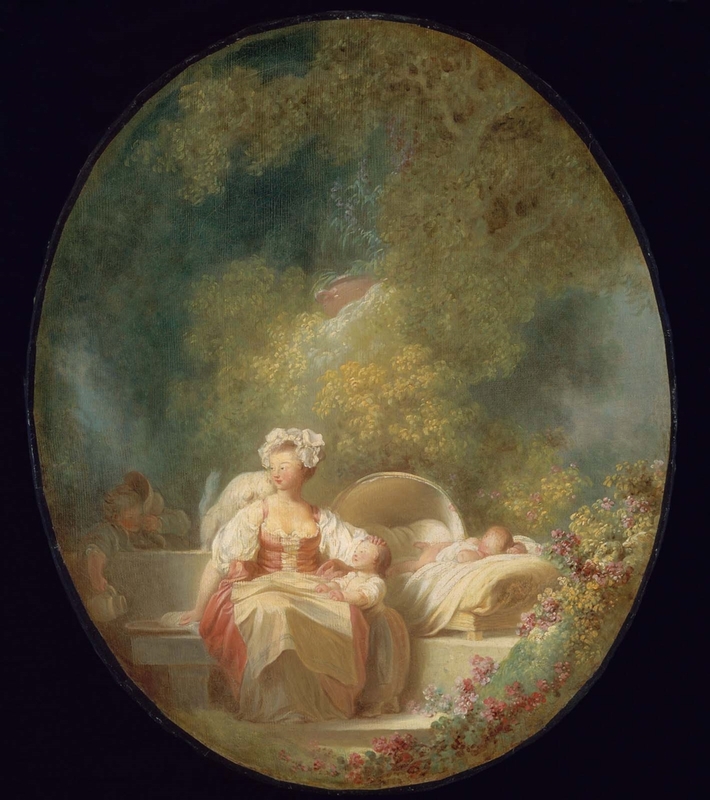 The existence of other paintings of the same subject by Fragonard makes tracing the early history of "The Good Mother" difficult. However, the painting of this subject in the Lafontaine sale is described as oval and measuring about 24 x 20 inches, and is probably identical to the MFA composition. Georges Wildenstein, "The Paintings of Fragonard, Complete Edition" (Phaidon, 1960), p. 299, cat. no. 451, identifies the following painting(s), all sold in Paris, which might also be identical with the MFA painting: November 12, 1810, lot 17; August 1, 1812, lot 3; January 18, 1813, lot 52; Roland sale, March 22, 1830, lot 385; d'Houdan sale, May 6-8, 1858, lot 127; December 14, 1875, lot 34. He lent the painting to the exhibition "L'art au XVIIIe siècle," Galerie Georges Petit, Paris, 1883-1884, cat. no. 60. He first lent the painting to the MFA in 1934.